and the people who work in them. How do you increase efficiency? Where do you find additional savings after you’ve already tightened your belt? What’s the best way to communicate with your constituents? Who do you call when you need an outside expert to corroborate your action plan? We help governments and nonprofits answer those questions so they operate more effectively. Bringing solutions into focus for governments and nonprofits. At The Novak Consulting Group, we give our clients innovative thinking that strengthens organizations by bringing solutions into focus. We offer an exceptionally high level of management consulting services, combining the personal attention and flexibility of a small firm with the sophistication and senior-level expertise of a large firm. Thanks for visiting our website. We hope you’ll take a moment to look through it, learn more about us, and then call or email us for a meeting. Also, become a fan and visit often to communicate with us on Facebook and keep up with news here at The Novak Consulting Group. 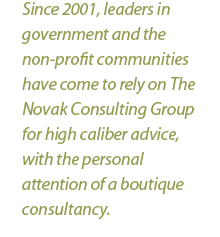 The Novak Consulting Group is a STAR Affiliate, committed to improving the STAR Community Rating System and supporting local governments’ efforts to create more sustainable communities. To learn more, visit www.starcommunities.org.